Show the Ori the true food of the Gods with Cameron Mitchell’s Norwegian Gjetost omelet. 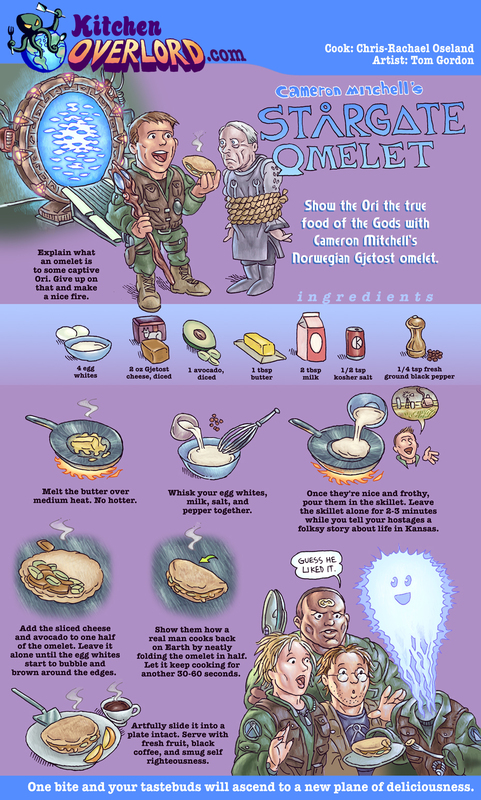 Explain what an omelet is to some captive Ori. Give up on that and make a nice fire. Melt the butter over medium heat. No hotter. Whisk your egg whites, milk, salt, and pepper together. Once they’re nice and frothy, pour them in the skillet. Leave the skillet alone for 2-3 minutes while you tell your hostages a folksy story about life in Kansas. Add the sliced cheese and avocado to one half of the omelet. Leave it alone until the egg whites start to bubble and brown around the edges. Show them how a real man cooks back on Earth by neatly folding the omelet in half. Let it keep cooking for another 30-60 seconds. Artfully slide it into a plate intact. Serve with fresh fruit, black coffee, and smug self righteousness. One bite and your tastebuds will ascend to a new plane of deliciousness.